The clip is a collaborative project created with the help of Kara Walker and Ari Marcopoulos. Santi grooves with a puppet version of herself while cutting to a beggar Santigold holding a “will work for blood” sign. 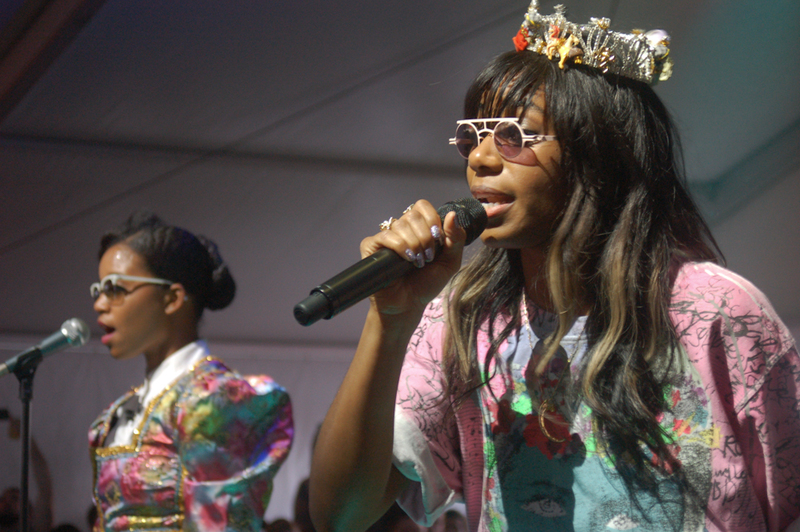 “Banshee” is the latest of Santigold’s collaborations with renowned visual artists. She has previously collaborated with a number of artists such as Wangechi Mutu, Kehinde Wiley, and Photographer HAL. The artists came together when the artists met in Milan during a Gucci fashion show worked on by Ari and Santi’s husband, Trouble Andrew. Kara stated “We hung out all night, and at the end of the evening Kara and Ari said, ‘Let’s do a video together!’ Santi explained, “and Kara snapped a silhouette photo of me in the dark as I stepped into my cab”. The New York-based Kara Walker has made a career of creating art that explores themes of race, gender, and sexuality in the format seen in “Banshee.” Her silhouetted figures have been put on display in exhibitions around the world, including The Solomon R. Guggenheim Museum in New York; The Museum of Modern Art, New York; The Metropolitan Museum of Art, New York; The Tate Gallery, London; the Museo Nazionale delle Arti del XXI Secolo (MAXXI), Rome. Marcopoulos discussed the video with the New York Times and stated that it was a collaborative effort, that flourished as the video developed. We decided to just all get together in the studio with the puppets, a bunch of lights, and just have a good time and made decisions as we went. It was a total team effort. My son Ethan was the cameraman and Kara’s daughter the stills photographer.